In January 1995, after months of training, Eileen Collins and six other astronauts began final preparations for NASA mission STS-63: her first flight into space. Besides literally blasting through the glass ceiling, the flight would be only the second of the new joint American-Russian space effort. After lifting off from Florida at night, Eileen and Commander James Wetherbee steered Space Shuttle Columbia towards a rendezvous high above the earth with MIR – Russia’s orbiting space station. 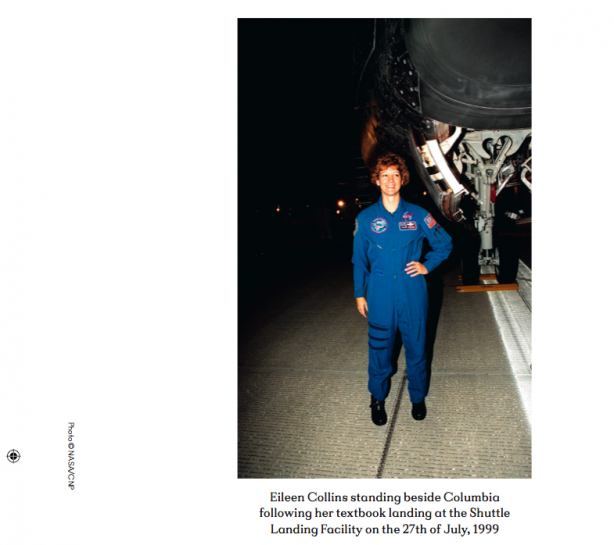 Like many astronauts, Collins says that first flight into space changed her fundamentally. During the mission, Collins and the rest of the crew were kept busy with their various tasks, which including retrieving an astronomy satellite from orbit and flying close to the Russian space station. As she explains, it was the beginning of a carefully laid-out plan that changed the course of world history. In a new world where the Cold War was still a very fresh memory, getting two former adversaries together for a joint project seems even smarter in hindsight. Collins cites the brevity of the 2007 invasion of Georgia, asking whether the situation would have escalated if the US and Russia hadn’t spent much of the previous decade working together on such a high stakes project together. She points out that ambitious future missions, like a return to the moon, will almost definitely involve working with international partners – and wonders whether that would include China, with whom NASA does not currently collaborate. Back in 1995, with Collins in one of the front seats, Columbia was plunging back through the atmosphere at 18,000 miles per hour, heading for Kennedy Space Center in Florida. When returning to earth, the Shuttle was basically just a giant glider, dropping steeply downwards and landing at almost twice the speed of an airliner without any engine power. Approaching the runway at such high speeds, with no chance of a second attempt, is a testing time for the pilots, but on February 11 – after eight days in space – Eileen touched down safely on planet earth. Chris Hatherill's full 10-page article appears in Issue 25 of AnOther Magazine.